It has been a joy to read and review. 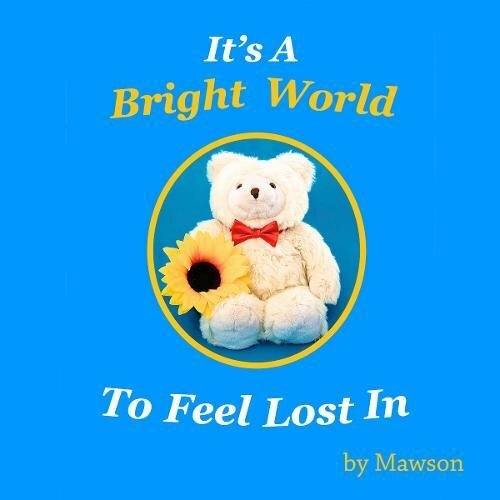 Mawson is such a wise bear that helps you see ways to deal with things that happen in life that make you sad, while the world just carries on. The title is perfect. It’s a Bright World To Feel Lost In. There is such deep meaning in this little book, which has flash tags with word relating to the story that describe feelings in many ways. The things we share with each other, good and bad. The simplicity of the story just opens up your feelings straight away making it a very emotional and yet comforting knowing your are safe. It helps you see that you should move on, learn new things and perhaps even find someone new to love and be loved with. Being found is such a joy! A bear’s love is never far away and can be shared and passed on through generations. I love the idea of Mawson telling the story to the young bears as if to coach them for their future roles. Just pure magic! A modest bear of generous proportions, distinctive in his fur coat and bow tie, Mawson speaks, as softly as you can imagine, about being one’s best in an often baffling world. He’s always confident, deep down in his inner-most stuffing, that the world is bright. In his first book, he ponders that inexpressibly baffling thing, the feeling of being lost. His next book, “She Ran Away From Love” will be out in the wide world in 2018. Reblogged this on Baffled Bear Books.